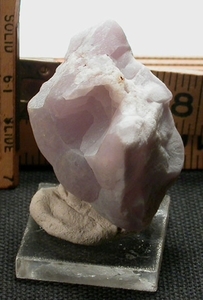 Here is a bi-colored deeply lavender, very botryoidal, very rare yttrium fluorite - an excellent miniature of 1-1/4x 1-5/8x 1-3/4". Mamillary shaping is very evident and there is light, bubbly natural etching. Suede-like texture and super translucency make an enticing piece for your collection.